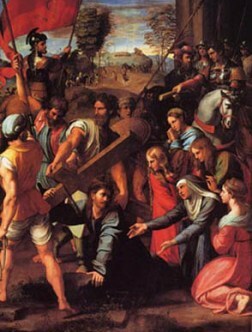 The Fourth Sorrowful Mystery - the Carrying of the Cross by Jesus – from the Gospel according to John, chapter 19, verses 16-17 & Luke, chapter 23, verses 26-31. Then [Pilate] handed him over to them to be crucified. So they took Jesus, and carrying the cross himself he went out to what is called the Place of the Skull, in Hebrew, Golgotha. ... As they led him away they took hold of a certain Simon, a Cyrenian, who was coming in from the country; and after laying the cross on him, they made him carry it behind Jesus. A large crowd of people followed Jesus, including many women who mourned and lamented him. Jesus turned to them and said, "Daughters of Jerusalem, do not weep for me; weep instead for yourselves and for your children, for indeed, the days are coming when people will say, 'Blessed are the barren, the wombs that never bore and the breasts that never nursed.' At that time people will say to the mountains, 'Fall upon us!' and to the hills, 'Cover us!' for if these things are done when the wood is green what will happen when it is dry?" “By accepting in His human will that the Father's will be done, He accepts His death as redemptive, for 'He Himself bore our sins in His body on the tree' (1 Peter 2:24)". (Article 612 of the Catechism of the Catholic Church). While meditating on the mystery of the carrying of the cross by Jesus, pray also for the release of its fruit, patient endurance. This concludes the Fourth Sorrowful Mystery. Click here to continue with the Fifth Sorrowful Mystery.